I am sucker for silly quotes, little poems written on napkins, the twisty turns of words to make people smile. That is me. That is a part of who I am. It makes me - me! I have had the fortune to pass this on to my daughter, so together we can giggle at things that say "Thumb bunny loves you - with a thumbprint made into a bunny... and so on. 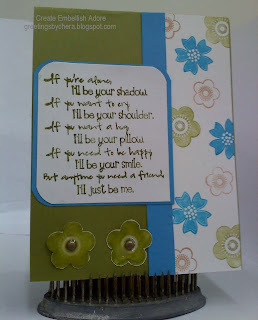 I found this poem, and knew it would be a perfect friend card.. heck it would be great in a frame sitting at everyone I know's home - but I cannot do that, I will make cards and hand them to everyone I know instead! Who wouldn't want a card like this in their mailbox? Poem reads- "If you're alone, I' ll be your shadow. If you want to cry, I' ll be your shoulder. If you want a hug, I' ll be your pillow. If you need to be happy, I' ll be your smile. Ingredients: CS: Old Olive, Whisper White, Pacific Point Blue; Stamps: Eastern Bloom; Others: Brads, Crystal effect. Hi Chera! I got your message through SU Creations and had to come and have a look at this gorgeous card! I love the poem you have on here - is it printed? It's just adorable! TFS!